HAMPTON, VA-- When the audience first saw Sophomore Nesia Banks, she was wearing a black corset and long dark tulle skirt. The Wicked Witch of the West was yelling at the flying monkeys who were aiding in her evil plans. It was the best thing about The Wiz, said one very biased audience member.? "My favorite part of the shows was seeing my daughter perform," said Irena Banks. "I grew up in the '70s and watched the movie all the time as a kid, so it was nice seeing everything come together." The Wiz, a musical from the 1970s based on The Wizard of Oz, was the latest production of The Hampton Players, the University's theater department. The show premiered March 20 and ran through the 24th. 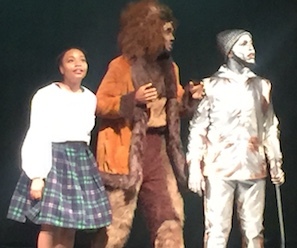 Hampton's version of The Wiz added modern dance moves from the past few years, modern slang and added modern musical touches, while remaining the same musical that holds a special memory in the hearts of audience members. "It's fun, it's funny and they make relevant references," said student usher Addison Adams. "We got to see them opening night and seeing them improve with each show has been a cool experience." The musical tells the story of Dorothy, the Scarecrow, the Tin Man and the Cowardly Lion in the context of 1970s African-American culture. It is a household classic in African-American families. Audience members seemed excited to see the story come to life.? Part of modernizing the show included costuming the Tin Man in a silver sweatsuit paired with tennis shoes. Cast and crew members have prepared a show with complicated sound, lighting and costume changes. They pulled it off without any noticeable errors. That let the audience, especially the proud mother Irena Banks, focus on the acting and singing. "My favorite song was "No Bad News," so I kind of just emulate what I've already seen," said Wicked Witch Nesiah Banks. "If people come and remember my character's name and what I did, that makes it even more humbling, but I just want people to enjoy the show."